You can always use the Selection tool to select a stroke or fill so that you can modify it by using any of the Swatches popups or the Stroke Style menu on the Properties panel. But, what do you do if you want to add a stroke or fill to a shape that was drawn without one or the other? The answer to this dilemma is found in a trio of tools that work nimbly together to provide one of the most unique graphics-editing solutions found in Flash. You use the Eyedropper tool to acquire fill and stroke styles or colors, and use the Paint Bucket and Ink Bottle tools to transfer these characteristics to other shapes. These tools only apply changes directly to shapes, shape primitives, or drawing objects, so to modify an element that has been grouped or converted into a symbol, you must first access the element in Edit mode. The dropper icon that appears when you use the Selection tool to select colors from any of the popup Swatches menus is similar to the Eyedropper tool available in the Tools panel. However, when pulled out of the Tools panel directly, the Eyedropper tool (I) has slightly different behavior. Although you cannot use the Eyedropper tool to sample colors from elements outside the Document window, you can use it to sample line and fill styles or to simultaneously change the stroke and the fill color chips to the same sampled color. When picking colors by using the dropper from the Color panel swatches popup, press and hold the mouse as you roll over color chips in the popup or colors anywhere on your desktop and release the mouse only when you are hovering over the color that you want to sample. The preview in the swatches popup changes as you roll over different colors, and the color chip changes when you release the mouse to load the color that you have selected. If you are using the dropper from the Tools panel color chip swatches popup, the behavior is a bit different: Click once on the color chip to open the swatches popup, and then move the dropper to roll over any color in the popup or on your desktop and click again to pick the color and load it into the current color chip. The droppers available from the swatches popups for any of the color chips in the Properties panel work the same way as the droppers in the Tools panel swatches popup, but they are limited to picking colors from within the Flash application (or the currently loaded swatches). The Eyedropper tool doesn't have any options in the Tools panel because they are all built in. As you hover over an item, the Eyedropper tool displays a small icon to indicate whether it is over a line or a fill that can be sampled by clicking. When a line is sampled, the Eyedropper tool automatically converts to the Ink Bottle tool, and when a fill is sampled, the Eyedropper tool converts to the Paint Bucket tool. 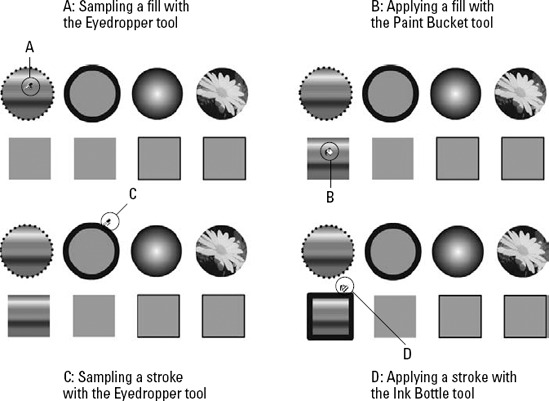 The composite image shown in Figure 1 shows the icons that appear when you use the Eyedropper tool to sample a fill (A) and apply it to another shape with the Paint Bucket tool (B), and sample a stroke (C) and apply it to another shape with the Ink Bottle tool (D). Any items already selected when the Eyedropper tool samples a stroke or fill immediately acquire the applicable stroke or fill style. This is the quickest way to transfer the fill or line styles of one element to a whole group of elements. 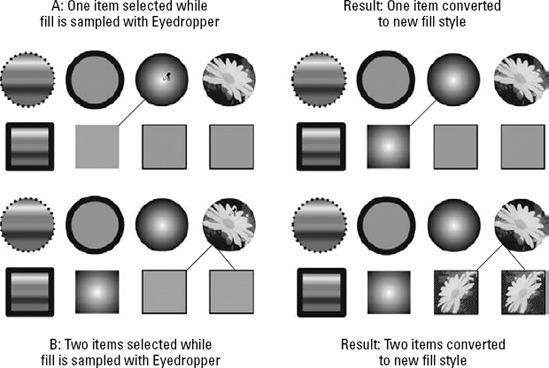 Figure 2 shows the Eyedropper tool used to sample a fill with one (A) or more (B) elements already selected. Figure 2. The Eyedropper tool also instantly converts selected elements to the sampled fill or stroke style. When you press and hold the Shift key while clicking a line or stroke color with the Eyedropper tool, the Fill and the Stroke color chips both convert simultaneously to the newly selected color so that it can be applied with any of the other drawing tools. The Ink Bottle applies the current stroke color and line style, either sampled with the Eyedropper tool or chosen from the popup in the Tools panel or the controls in the Properties panel. When you click to sample a line with the Ink Bottle tool, all other currently selected lines are changed simultaneously. The Ink Bottle tool is especially useful for applying custom line styles to multiple lines. You can build a collection of custom line styles either off Stage or in a special custom line palette saved as a single-frame Flash movie. You can then acquire these line styles whenever you want to reuse them. You can add Flash files with graphics libraries that you plan to reuse to the application's Libraries folder so that they can be easily accessed from the Window => Common Libraries menu. Depending on the level of zoom, some lines may not appear accurately on the screen — though they print correctly on a high-resolution printer. You may adjust Stroke weight in the Fill and Stroke section of the Properties panel.